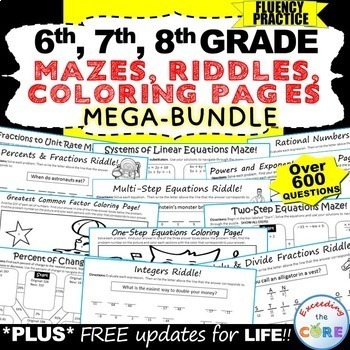 This 6th GRADE COMMON CORE MEGA-BUNDLE includes 14 of my top selling resources (over 150 pages of warm-ups, task cards, error analysis worksheets, problem solving graphic organizers and answer keys). 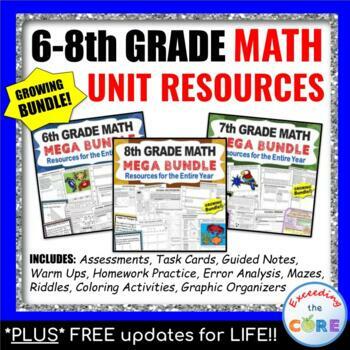 As a current middle school math teacher, I am using the activities in this resource bundle for WARM UPS, HOMEWORK, math CENTERS, ASSESSMENTS, EXIT TICKETS and TEST PREP . ✔ You will be entitled to download all additional 6th grade common core resources that are created in the FUTURE for FREE! !